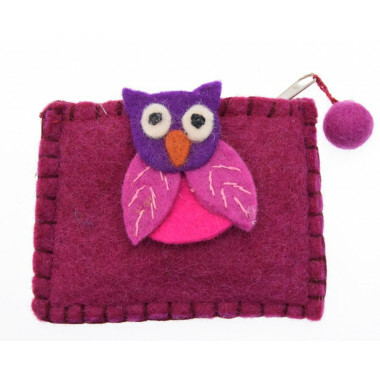 Find a very trendy owl on this pretty pocket wallet with brooch. Find a very trendy owl on this pretty pocket wallet with brooch. Crafted in a sustainable way by the English brand Kusan, this pocket purse is available in 5 different colours: red, turquoise, pink, fuschia and green. Inner fabric: polyester. Zipper fastening. Size: 13 x 10 cm. 100% wool - inner fabric 100% polyester.